When I was a hairy student, I went through a slightly worthy phase and purchased a Peter's Projection map (of the Earth) from Oxfam - note this sat incongruously next to posters of the movie Betty Blue and Madchen Amik from Twin Peaks. The map of the earth we're all used to is the Mercator map, but for all sorts of geeky reasons this does not provide an accurate visual portrayal of land mass, (the Mercator projection increasingly inflates the sizes of regions according to their distance from the equator). Apparently, it's difficult to portray size and shape accurately. To achieve a 'truer' shape of land mass, you sacrifice proportionality, and vice versa. The end result being that the relative sizes of countries/continents are distorted. When I was a hairy student, I went through a slightly worthy phase and purchased a Peter’s Projection map (of the Earth) from Oxfam – note this sat incongruously next to posters of the movie Betty Blue and Madchen Amik from Twin Peaks. The map of the earth we’re all used to is the Mercator map, but for all sorts of geeky reasons this does not provide an accurate visual portrayal of land mass, (the Mercator projection increasingly inflates the sizes of regions according to their distance from the equator). Apparently, it’s difficult to portray size and shape accurately. To achieve a ‘truer’ shape of land mass, you sacrifice proportionality, and vice versa. The end result being that the relative sizes of countries/continents are distorted. Now despite what some of us have been told, size does matter. When world leaders sit round the table, their influence is partly a function of their population size and the productive land mass they occupy, so it’s important both from a symbolic and political (some would even say moral) perspective to get this right. This is a map which tries to accurately portray land mass. 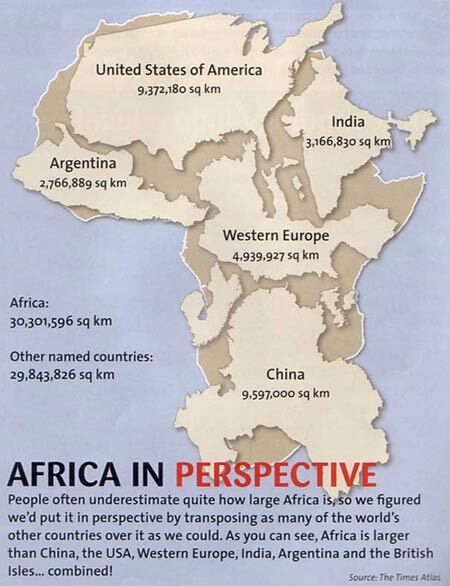 Look at the size of Africa, and look at the size of Europe! It makes you think. I bet you didn’t know this! Anyway, I thought it would be useful to share this with you. It’s one of things that can shake you up a little.